Today we’re talking about what you can and can’t see on an x-ray when you have a running injury. When you hear the term x-ray vision what do you think about? You may recall some comic book character. You might picture Superman peering into Lois Lane, checking to see if she has any internal damage after she’s been injured? X-ray vision is superhero stuff for sure. And many runners seem to hold medical x-rays to the same sort of super hero status. They think that xrays can show everything. But that’s not true. The first thing you have to understand is what an x-ray image actually is. X-ray images have been used for over 100 years. The medical term for an x-ray is a radiograph. I am not going to boar you with all the physics of x-rays. All you really need to know is that when getting an x-ray the burst of x-rays goes through your foot and then hit an x-ray receiving plate to expose the film or a digitized plate. When the x-rays pass through your foot the calcium in the bones tends to absorb more of them than the soft tissue. The X-rays move faster through the soft tissue and do not get absorbed as much. The result is a black-and-white image that you see as an x-ray. The bones look white and the less dense. The soft tissue is some range of hazy grey to black. But it’s not an actual picture. It’s a representation based on the tissue’s capacity to absorb energy. It’s not like Superman peering into Lois Lane to see if she’s injured. So no, they are not a perfect picture. But still, X-rays are great at looking at the skeletal structure of your foot and ankle. You can certainly get a lot of information about the bones and joints in your foot when looking at an x-ray image. If the bone is broken, the fracture or break, may show upon on an X-ray. Sometimes this is easy to see. If you have a long straight bone and it’s broken in half and it shifted out of alignment, well, it’s obviously broken. These are the fractures that are easy to spot on x-ray. If you read the x-ray report you could find a variety of technical terms. A “step off” is what a doctor sees when the edge of the bone is cracked and it looks like a little stair step. “Angulation” is where the doctor sees a change in direction of a bone that otherwise should be straight. “Displacement” is the term doctors give to a gap between two broken pieces of bone. “Linear radio-opacity” is just a term for a dark line representing a gap in the bone that should be white. It’s usually synonymous with a fracture. “Double density” is just the opposite. That’s where the bone is broken and overlapped so it absorbs twice as much x-rays and appears to be bright white and twice as white as the surrounding bone. All of these are relatively easy to find X-ray abnormalities. If something is really wrong these are easy to spot. Of course, the problem with runners is that trying to figure out what is wrong with your foot when you just have this occasional aching pain and you’re concerned you have a stress fracture is a much more subtle game. But understanding the myth and realities of X-ray imaging can help any runner know which questions to ask your doctor. Myth #1: any runner with foot pain should get an x-ray. If you have ever gone to the emergency room with foot or ankle pain you may have had an experience something like this. You sign in at the front desk and wait for hours, as someone coughs next to you and someone else sleeps in a chair on the other side of the waiting room. After what seems like hours of waiting, a nurse calls your name, escorts you through some double doors and starts to ask you a bunch of questions. After some more waiting you are escorted to the Radiology department where you get x-rays of your foot or ankle. You’re taken back to your little curtain wrapped cubicle. The nurse hangs the x-rays on an x-ray view box somewhere nearby. And you wait again. But finally a doctor shows up. The doctor looks at your x-rays and says, “Okay tell me what happened. She may even poke and prod around on your foot to see where it hurts. The doctor explains to you that nothing appears to be broken on the x-ray. In many cases, at that point the doctor will hand you a set of instructions on how to ice and protect the foot and let it calm down. In that case, you’ve probably just been diagnosed with a sprain, even if the doctor didn’t take the time to actually explain it to you completely. This scenario is so common that Canada actually did a big study which resulted in the guidelines known as the Ottawa Ankle Rules. The Canadian Health Service was spending tons of money on foot and ankle x-rays. In the simplest terms The Ottawa Ankle Rules say this if you can walk more than 4 steps, and you don’t have any pain when your press on the navicular bone, the 5th metatarsal bone, the end of the fibula or the end of the tibia, there is a very low probability that you have a fracture that might show up on x-rays. Granted…these guidelines mainly cover ankle sprain patients, but the point is most patients with foot pain don’t need x-rays. My personal feeling is that no doctor should order x-rays unless she believes you have a fracture, a joint problem, or something that will actually show up on x-rays. Myth #2: a stress fracture will show up on an x-ray. Early in the progression of a stress fracture the x-ray will look totally normal. There is no crack. There is no visible break in the bone. Nothing abnormal at all. The bones all look totally normal. If all you have is a normal looking x-ray to make the call, you may incorrectly think everything is okay. To make matter worse, you might even have a report from the radiologist that confuses things further. If the radiologist doesn’t see anything she may say, “No evidence of fracture, dislocation or subluxation.” Which is doctor-speak for…totally normal foot x-ray. So if your treating doctor doesn’t really know the whole story about your pain, she may think you are A-Okay. But you could still have an early-phase stress fracture. You could have a soft tissue tumor. You could have a nerve issue. Or some other inflammatory condition that doesn’t show up on an x-ray. You have to understand that initially a stress fracture in a foot bone like a metatarsal is just inflammation. The bone is stressed, and irritated but it’s not really broken in the truest sense. If you keep running on it the aching foot it will eventually start to develop a crack. But a big visible crack in the metatarsal bone comes much later. Myth #3: an x-ray can prove you don’t have a stress fracture. As just mentioned stress fractures are invisible on x-ray in the early stages. So you cannot truly rely on x-rays as a way to get the all-clear to run. Of course, that’s what runners want. They want to get an x-ray to find out for sure that there is no fracture. They want reassurance that they can run. But if you just started having some aching pain in your foot and you’re worrying about a stress fracture, an x-ray just can’t do it for you. The only thing an x-ray can do in terms of ruling out a stress fracture is to look at them over time when you get serial x-rays. This is the standard approach in most doctors’ offices. If you show up with some aching pain in your foot that sounds suspicious for a stress fracture, the doctor will take an initial x-ray. If the doctor really suspects that you have a stress fracture, even though the first x-ray looks normal, you may be told to decrease your activity and then come back later for follow-up. Over time as stress fracture healing takes place, the bone will start to develop a thickening of the bone around the stress fracture site. Your body starts to lay down a bunch of collagen and calcium to reinforce and stabilize the fracture. It is sort of the physiologic equivalent to spot welding. And it looks somewhat like the sort of knot you find in a tree branch. It’s basically just extra material layed down to strengthen the injured bone. But it takes time. So, if you follow-up with the doctor and repeat the X-rays at 6 weeks, 12 weeks or 18 weeks you may eventually see this lump in the metatarsal suggesting a repair process is going on . But only after you have given it time and failed to see this lump develop, only if there has been absolutely no change in the bone at any of those following x-ray intervals, only then can you safely rule out a stress fracture. So it’s really only the change seen in the bone on those subsequent x-rays that doctors will use as evidence that you really did have a stress fracture when you first started having pain. That also partially explains why doctors will tell you to stop running, even if they took an x-ray and saw nothing. They may quietly suspect you have a fracture that just hasn’t yet started to show itself. Myth #4: you need x-rays every 2 -4 weeks to assess healing. Part of the reason doctors want to follow up with you is to make sure that you’re healing and getting better. Another reason doctor’s want to follow-up with you is to perform serial x-rays and see if there actually is a stress fracture. So of course the majority of their interest is in taking care of you. But it is also common for doctors to perform serial x-rays to mitigate legal liability. It helps if they have proof that you had no stress fracture, should something go wrong. But of course if you do think you have a stress fracture on your initial visit and nothing shows up on the x-ray, the doctor is almost certainly going want to do x-rays every 2 to 4 weeks just to see whether or not you’re developing any of the later signs of a stress fracture. But again, this is really diagnostic it’s not therapeutic. If the doctor is certain that you have a stress fracture, they will at some point want to repeat x-rays to see radiographic signs of healing. What we actually look for on the x-ray is little white lines across the fracture site. Doctors call those lines “trabeculation.” Those little white lines signify ridges of calcium within the bone. They suggest that the bone is healing well and that it should be sufficiently stable. Most doctors would agree that trabeculation suggests the bone is stable enough to walk on it. But you will get a wide range of opinions about whether or not any x-rays sign will allow your doctor to conclude that it’s safe to run. Running makes doctors nervous. Myth #5: An x-ray can tell you if the bone is healed enough to run. I myself would not tend to rely on an x-ray alone as sufficient evidence to let you run. No matter what your x-ray looks like, if you still have pain when you walk or when I push on the metatarsal bone, that is a really bad sign. However if you have evidence of healing on the x-ray and you have no pain or tenderness when I manipulate the fracture site, that is a really good sign. 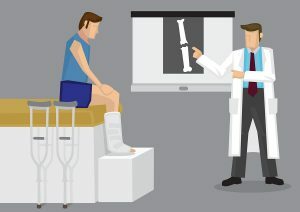 So although x-rays can be useful in helping your doctor determine where you are in the course of healing, your story, the pain that you have (or lack thereof) and the findings of the clinical exam when the doctor pokes and prods on your foot are crucial to determining whether or not it is safe for you to go for a run. If you have lots of swelling, or any bruising, this would signify an ongoing process of tissue damage and inflammation. Even if your x-ray looks pretty good but you have bruising and swelling it would be unlikely that I would suggest you should go for a run. The other thing to consider is decreased bone density. If you’ve been on crutches, or in a cast, or a fracture walking boot for an extended period of time, you can actually get loss of bone stock. Most people think of this as “osteoporosis.” But the actual medical term for a mild decrease in bone density is actually “osteopenia.” “Disuse osteopenia” is what happens when you don’t use an injured structure and the bones get weaker. This is exactly what happens when you use crutches and you’ve been in a cast. I once saw a patient who had to spend 12 weeks in a fracture walking boot. As a result of all of that time in the boot she got disuse osteopenia. The day that she got out of the fracture walking boot she went for 3 mile run. Her bones were so weak that she actually got a metatarsal fracture just from that one run. A single x-ray by itself won’t actually tell you how much disuse osteopenia there is. In some cases you can compare the x-rays to prior images and get an idea. More than anything else the doctor has to factor in the amount of time, and the type of treatment that might cause disuse osteopenia to develop. For that reason a radiologist (who just reads x-rays, but never actually sees you) will almost never know the whole story. And that is the reason that your x-ray report is not nearly as useful as the images themselves. In some cases you don’t really need x-rays at all before you run. I had one patient who is an elite triathlete who broke her heel bones. But the heel bone heals very quickly. She frankly was not interested in having any unnecessary radiation. She didn’t really want x-rays. I was fairly confident, based on her clinical exam that she was completely healed. She had no pain or tenderness and I felt safe letting her run, even without getting x-rays to look for radiographic signs of healing. So in some cases X-rays can help your doctor decide when you can run, and in some cases they aren’t really necessary at all. It all depends upon your particular injury and your doctor’s approach. Myth #6: your only need x-rays of the painful foot. Generally speaking, you only need to get x-rays of one foot: the one that hurts. But there are exceptions. If you stepped in a hole or your foot slipped off of a root when you were running on a trail you could have a relatively rare injury called a Lisfranc fracture. I’m not going to torture you with the details but these are fractures in the mid-foot that are often missed in the emergency room and doctors’ offices. In fact I often lecture to physicians at medical conference specifically to teach them how to not miss these types of injuries. 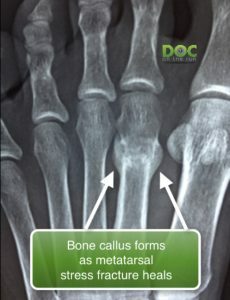 One of the findings on X-ray that suggests a Lisfranc injury is a very small change in the amount of space between your first and second metatarsal bones. This can be so subtle that it’s very difficult to see. 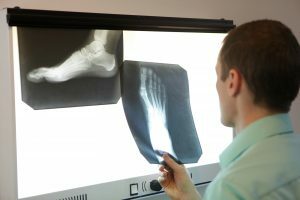 However if your doctor takes x-rays of both feet and compares one foot versus the other, the difference can become more apparent. In those cases, having x-rays of both feet can be extremely helpful to your doctor. Myth #7: your doctor needs x-rays to assess your foot type and biomechanics. X-rays show the structure of your feet. At least the structure of the bones in your feet when your feet are sitting still on an x-ray plate. Biomechanics refer to movement of biological systems. X-rays don’t really show you much about your actual biomechanics, they just point out the structure of the joints and the bones. 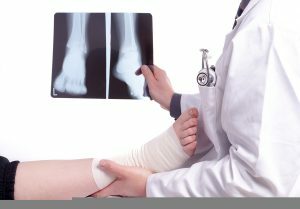 The truth is that just about any podiatrist can look at your feet and predict most of what would be found on x-rays. There are many outward signs of the inward structure of your feet. If the doctor is really concerned about your running biomechanics it’s more important to watch you walk and watch you run than it is to look at an x-ray. X-rays are needed to look for specific abnormalities. They’re not really useful for assessing your biomechanics. Myth #8: x-rays of the foot are harmless. I’ll keep this short. Totally not true! However…in terms of comparing different types of x-ray imaging for different body parts, it is true that foot x-rays deliver extremely small doses of radiation, especially when compared to chest x-rays or an abdominal CT scan. But it’s still radiation. The most extreme risk with radiation occurs to a developing fetus when a pregnant woman has an x-ray exam. That is why most facilities will ask you whether or not there’s any possibility that you could be pregnant if you’re going to get an x-ray. It is widely accepted that X-ray exposure to a developing fetus can cause a whole host of disorders including mental retardation, growth retardation and leukemia. The risk to an adult is far lower but there is still risk. Radiation exposure and risk is additive. The more radiation you have the higher the chances you will get cancer later in life. Although you can find many articles talking about “safe” levels of radiation in medical imaging, there is no scientific evidence that any exposure is completely safe. To the contrary there’s a great deal of evidence that any level of extra exposure can increase your risk of cancer. But just to be clear, the types of x-rays of your foot when you think you have a stress fracture are some of the safest and lowest risk levels of x-ray exposure. So if you need an x-ray because your doctor decided that you really should have an x-ray because he is concerned that you have a stress fracture, don’t let the concern for radiation risk outweigh the benefit. Myth #9: x-rays are expensive. Runners often seem hesitant about x-rays just because they worry medical imaging will be expensive. And while most things in medicine seem to be outlandishly expensive, x-rays are the one procedure where you may get a break. X-rays may be one the least expensive medical procedures on the planet. In fact, here in San Francisco when I send injured runners to an outpatient imaging facility, they can get an x-ray of the foot for about $20. So even if I order 3 different views, the total cost is only about $50 or $60 if they pay cash. So x-rays are super-cheap! Having said that, you have to realize that X-ray studies can vary widely in cost, depending upon where you get them. So buyer-beware! We found a website that actually posts average x-rays costs around the country. In San Francisco, the range could be $60 to $1,950. Getting the lowest rate is simple: go to the lowest cost place and ask for a cash discount. The most expensive place is the Hospital…that’s where you can get charged $1,950 for a 3 x-ray of your foot that takes about 3 minutes. Many doctors’ offices often charge a few hundred dollars for x-rays. If you call and try to get a cost estimate you may get the run-around. Don’t be surprised if the person answering the phone at the doctor office refuses to tell you the cost of a foot x-ray. Many doctors sign insurance contracts that specifically prohibit doctors from disclosing contracted rates to patients. I know… sounds like conspiracy-theory crazy talks…but it’s true. But that is a tangent for another episode. The lowest rates are usually found away from the doctors and hospitals. Outpatient imaging facilities are all over the place. All you do is go to the imaging center, get your x-rays, and go home with the x-ray images on a disk or on film. 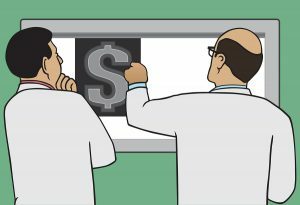 Imaging centers run like efficient business, not like the cash-eating monster hospitals. And they pass the savings on to you. If you tell them you are paying cash, you can often get a discount. That’s how many of my own patients wind up with $20 x-rays. So do your homework and don’t pay $2,000 or anything close to it for x-rays. Myth #10: You have to see a doctor before you can get an x-ray. An x-ray is a medical procedure and you have you have to an order from a doctor to get one. In places like Mexico or Thailand, you may be able to walk into an imaging facility and leave with an x-ray, but in the United States, x-rays require a doctor’s order. But that doesn’t mean you have to hock your Garmin to afford an x-ray. Even if you don’t have insurance there are options. For example, if your go to a doctor’s office, the doctor has to pay rent and has to pay all of the staff. If I were to see you at home during a house call, that would be relatively expensive because I have to drive to your house. However if we do a phone consultation, or if I see you remotely through a web visit, then it costs a whole lot less. If an x-ray is appropriate the order can just be faxed to the imaging center so you can get your x-rays. So although yes, you do need a doctor’s order for an x-ray, you can get an x-ray order set-up through a remote consultation or telemedicine visit with a doctor that can cost much less than a house call or in-office visit. 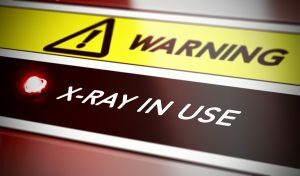 Believe it or not many doctors who order x-rays never actually even see the x-rays. Instead they simply read a report about your x-rays from another doctor called a radiologist. Radiologists are specialized doctors who are experts in medical imaging. They sit in the radiology room and read films all day. After the radiologist looks at your x-ray he sends a “radiology report” to the ordering physician. So why is that? Well, the radiologist didn’t even see Sally. The radiologist just saw the x-ray. The radiologist doesn’t know the whole story. He is just looking for abnormalities on the images. Because the radiology reports can be so non-committal, the treating doctor may be underwhelmed by the report, when in fact she should be more worried. In my opinion it is always best if the treating doctor, the one who knows your whole story, actually looks at the x-rays. I always look at the images myself. Even if a patient gets an x-ray or MRI in Thailand, I have them send the image files to me electronically so I can load them in a viewing program, take a look and try to determine for myself whether or not there is anything significant. After that, we can use the radiologist report as a sort of expert second opinion. But I wouldn’t want to rely solely on the interpretation of one doctor sitting in a dark room, when they don’t have the whole story. When you hire a doctor, you are paying for expert care. After all, you hired an expert. You have a right to expect expert care. You have a right to expect the full attention and medical decision making of that expert. You deserve to have the opinion of the doctor when he reads the x-rays himself. The key takeaways here are that x-rays can be helpful to identify fractures and significant abnormalities when you have a severe running injury. But no x-ray alone can tell you the whole story. X-ray images can be helpful to track your progress if you have a stress fracture but they’re not always necessary. And if you really understand the whole process of getting the x-rays you can make sure that you look at the x-rays yourself, with your doctor, to get all of the expertise and input that you need to make sure that you have the whole story. You have to remember that as a runner your goal is to get back to running as quickly as possible. The default diagnosis of a stress fracture can leave you limping around in a fracture walking boot for weeks. During that period your hard-earned fitness could dwindle away. Don’t just accept the possibility of a stress fracture unless your doctor can really explain to you why she believes that you have one. You have to serve as your own advocate to make sure that you’re getting the most complete advice, that is really the most pertinent to you as a runner. «« Should I Worry About Pain When Running After My Injury Heals?